official Marc Bolan tribute - T.REXTASY. Read about his exploits; the gigs, the countries, and the people he has met along the way: Slade, The Sweet, Ian Hunter (Mott The Hoople), Cockney Rebel, Ray Dorset (Mungo Jerry), Marc Almond (Soft Cell), Clem Burke (Blondie), Alvin Stardust, Linda Lewis, The Damned, Shakin' Stevens, and of course, T.Rex, Tony Visconti, Gloria Jones & Rolan Bolan. 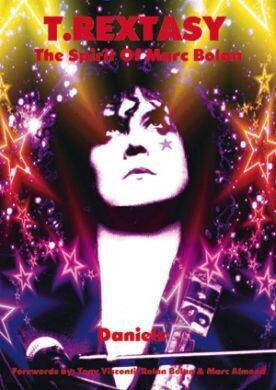 Interwoven with Marc Bolan stories and the acquisition of the Bolan master tapes!